You may have noticed the poster from Theta State Records in our window, but did you know that they’re all about music inspired by floating? Theta State Records was formed in Portland, OR in 2013 as an experimental side-project coming out of Float On’s music program. After our original release of “Music From the Void,” we fell in love with the incredible creative potential of combining musicians and float tanks – we’ve been tossing local artists in our tanks (and documenting their creations) ever since. We are a one-of-a-kind specialized label: From musician, to cover art, to post production, every step of the process is inspired by the float tank experience. Our artists are mostly Portland based, with an emphasis on ambient, chillout, and downtempo. 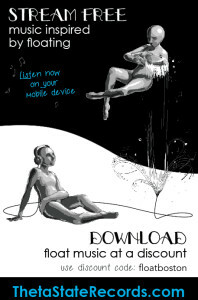 If you like what you hear, when downloading use our discount code: FloatBoston. Full disclosure: we have a consulting relationship with Float On, Theta State’s parent. Fuller disclosure: we contracted Float On because they do cool community-based projects like this, and that’s the sort of business we want to run. We look forward to doing collaborative projects as soon as we are fully open… stay tuned!